Phi (Φ) Chapter of Theta Chi Fraternity can trace its roots back to January 10, 1904. This is the date of the chartering of Alpha Mu, a local fraternity at NDSU. The Chartering members of Alpha Mu are Bert Corbett, Roger Brown, Fred Birch, Ross Fowler, Rufus Lee and Harry Porter. The purpose of this fraternity was to do all within its power to extend and upbuild the influence of the Institution of learning, among whose students these men were proud to be numbered, and to unite the members of the fraternity in a brotherhood so strong and lasting that its influence would become a determining factor in the life of every member, not only while at college but in after years as well. The symbolic significance of this emblem was as follows: a Dacotah Indian arrow-head is made use of as a token of the respect and admiration they had for their state and college. The arrow-head implied that the course of the fraternity and its members must at all times be straightforward and honest, but swift and undeviating as the flight of the arrow, in avenging an insult to itself or members. The equilateral triangle signified equality of members, integrity of purpose, and that the fraternal spirit of the organization should be as enduring and unchangeable as are the pyramids, in imitation of which the triangular design was adopted. The motto of the fraternity was—“An Alpha Mu is a man who knows all about you and is still your friend.” This motto was adopted because it was believed that there could be no genuine Brotherhood without mutual regard, good opinion and esteem, mutual charity, and mutual allowance for faults and failings. It is those only, who learn habitually to think better of each other, to look for the good in each other and expect, allow for, and overlook the evil, who can be brothers one to the other, in the true sense of the word. In college activities the Alpha Mu’s were always in the lead. They had members in every branch of activity and during the thirteen years of their existence, they had nine football, eight basketball and nine baseball captains elected from their number. The weekly Spectrum, the college publication, was usually edited by Alpha Mu’s as was the Aggasiz, the college annual. The members were the controlling factors in the student commission, in whose hands lie the school government. In the military department they were always well represented, as well as in the band and orchestra. Alpha Mu always made every legitimate effort to be a factor in the student life and organization of the college and was rewarded by more than a generous share of the honors to be won. Scholastic standing had particular attention and the chapter maintained, as well, a high moral level. In 1913, a group of men left Alpha Mu to form the Epsilon chapter of Alpha Gamma Rho, a chapter that is still in existence today. Their chapter house is fittingly located just next door to Theta Chi. Four years later in 1917 the men of Alpha Mu, with the help of former North Dakota Supreme Court Justice Judge B.F. Spalding ( ΘΧ Alpha Chapter Alumnus), petitioned Theta Chi Fraternity for a charter. The “local” Alpha Mu Fraternity was granted a charter by the Theta Chi Fraternity at the latter’s Sixty-First Annual Convention, held in Worcester, Massachusetts, on April 7, 1917. The charter was awarded on May 12th, 1917. This is the founding date of Phi Chapter. The charter members of Phi Chapter were: Walter Bender, Mortimer Keeley, Harold Kelly, Robert Lewis, Carl Loiland, Melvin McGuigan, Floyd Slingsby, Adrian Foley, Paul Peterson, Walter Elliot, Frank Henning and Harold Jacobson. Phi’s original chapter house is located at 1316 12th Ave N, just a short distance to the southwest from the current chapter house location. The groundbreaking ceremony for the current chapter house at 1307 N. University Dr. took place on May 5, 1927 at 9:00 pm. Construction of the house took 2 years, from 1927 to 1929, at a cost of $45,000. In the years after the chapter house was built it took on the nickname “Buckingham Palace” for its distinct styling. The interior has been remodeled several times but the exterior of the house has remained much the same. 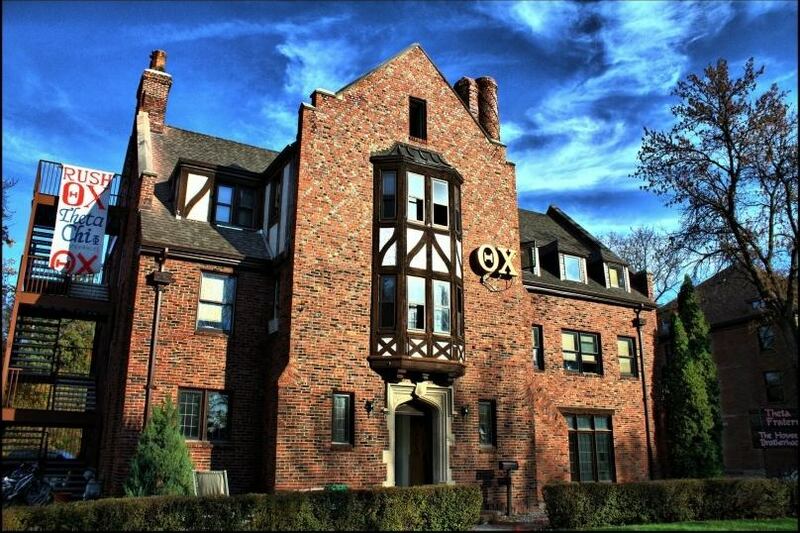 We brothers of Theta Chi take pride in our historic home, and know that it is a “House That Brotherhood Built”. Frederick Reginald Edward Colley (or Reginald E. F. Colley, as some records read) was born on July 13th 1888 in London, England and attended North Dakota Agricultural College (now known as North Dakota State University). Brother Colley was very active in the organizations on campus as a member of the Athenian Literary Society, where he served as treasurer; in Student Council; as a drum major in band; as an student manager for Athletics; as president of the Edwin Booth Drama Club; and most notably Theta Chi. As the 23rd initiate of Phi chapter, brother Colley served as Steward, Treasurer, and Secretary before graduating in 1915 with a Bachelor of Science degree in Chemistry. Brother Colley was extremely involved in local and civic organizations following his graduation. He served as the Associate Educational Director of the Associated Advertising Clubs of the World. He was also a member of the following organizations: Kiwanis, Coterie Club, Roycroft Club, Shrine, Scottish Rite, Gilbert C. Grafton Post of the American Legion, and Chandler Post Veterans of Foreign Wars. He served as drum major of the El Zagal Shrine Band, was a member of the Executive Board of the Fargo Commercial Club, and was elected President of the Town Criers Club. His involvement in the United States Army is notable. Brother Colley served as lieutenant of Company B, 164th Infantry on the Mexican Border and entered World War I as a captain serving the 164th Infantry, 41st and 42nd Division, 79th Division, 29th Division, 85th Division, and the headquarters of the Second Army in chemical warfare work. On January 26, 1919 he received his discharge and held the rank of captain unassigned in the Reserve Corps. Brother Colley was elected to the Grand Chapter of Theta Chi Fraternity in 1925 at the 69th Anniversary Convention held in Pittsburgh, Pennsylvania. He served as National Chaplain during his term on the board. As he lay critically ill in the New York Naval Hospital, funds were collected at the 71st Anniversary Convention in Washington (1927) for the purpose of making his last days as comfortable as possible. Brother Colley joined the Chapter Eternal on October 13, 1927 and the funds collected were used for his gravestone, made of the finest Barre granite (from Theta Chi Fraternity’s birthplace–Vermont) in the Long Island Military Cemetery. Brother Colley was the first Grand Chapter member of Theta Chi Fraternity to join the Chapter Eternal. Stuart Hall Kelley was a member of Phi chapter among the class of 1920. He was presented with the Distinguished Service Award from the Grand Chapter on April 10th, 1940 for his vision and efforts to expand the fraternity west of the Mississippi River. He later served the Grand Chapter as National President from 1948 to 1952, and is the only member of Phi chapter to serve as National President.